In general Resene recommends that you should not paint during pregnancy. 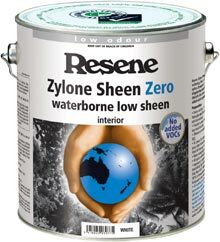 Waterborne paints contain very low levels of solvents and some none at all, such as the Resene Zylone Sheen Zero with no added VOCs. Thus the risk from exposure is very small. However, there are still potential hazards to be avoided. The stretching action when painting walls and ceilings or putting up curtains, if overdone, can cause problems during pregnancy. Of course climbing up and down step ladders etc. is also an underlying risk. Avoid oil based/solventborne products. Use only waterborne products. Do not use spray paints. Wear a suitable mask when sanding and painting. Do not eat or drink during painting. Ensure good ventilation during and after painting. Do not use any solvent for cleaning tools etc. Always consult your doctor or midwife if you have any concerns before carrying out a project when pregnant.